In2O3:Sn (ITO) nanoparticles: SEM/TEM images (above left), dispersion in ethanol (above right), cross-section of ink-jet printed ITO nanoparticle layer on polymere substrate (below) . Dynamic light scattering, dispersion and electron microscopy of ZnO:Al (AZO) nanoparticles (above) and ZnO:In (IZO) nanoparticles (below) . Transparent Conductive Oxides (TCOs) are of major technical importance, for instance, in flat displays, thin-film solar cells, organic light emitting diodes, and energy saving windows. State-of-the-art TCO is indium tin oxide (In2O3:Sn, ITO), which is commonly manufactured by thin-film deposition (e.g., magnetron sputtering, chemical vapor deposition) and structured by lithographic etching. Today's challenge of low-cost printable electronics and solar cells on flexible and heat-sensitive substrates (e.g. plastics, paper), however, requires the availability of alternative TCO materials (e.g., doped ZnO or SnO2), high-quality TCO colloids, and advanced electrode structures. Subproject F1.3: "Nanoscale Transparent Conductive Oxides" addresses the synthesis known TCO’s as high-quality nanomaterials as well as the exploration for new materials/compositions . High-quality nanoscaled TCOs (e.g. In2O3:Sn, ZnO:Al, ZnO:In) with uniform particle size, high crystallinity and excellent resistivity (i.e. 3×10-2 Ωcm) are prepared by liquid-based methods, including the synthesis in ionic liquids as well as in high-boiling alcohols (polyol method) [2,3]. Highly conductive layers are realized without the necessity of a thermal post-treatment. Alternative low-cost, less harmful TCO materials will also be explored. Based on our preliminary studies, highly conductive TCO colloids will be prepared and modified on demand for application in thin-film solar cells. To this concern, this subproject will first aim at delivering tailored TCO nanomaterials to the partners (with F1.5). Moreover, we aim at novel TCO materials to be used in thin-films in organic solar cells (with F1.5), CIGS-based solar cells (with F1.6) and as printable conductive layers (with F1.8). To guarantee for highly conductive TCO nanomaterials, knowledge on the position of the dopant inside of the host lattice, the optimal concentration of the dopant, the interaction of all kinds of lattice defects, specific surface conditioning as well as the presence of interphases and interfaces is prerequisite [2-5]. H. Goesmann, C. Feldmann, Nanoparticulate Functional Materials, Angew. Chem. Int. Ed. 2010, 49, 1362 (Review). G. Bühler, D. Thölmann, C. Feldmann, One-pot Synthesis of Highly Conductive ITO Nanocrystals, Adv. Mater. 2007, 19, 2224. 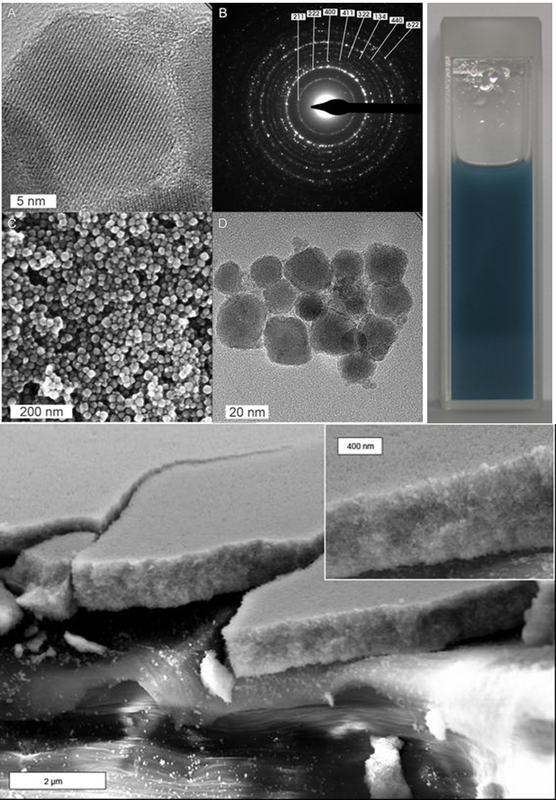 E. Hammarberg, Anna Prodi-Schwab, C. Feldmann, Microwave-assisted Polyol Synthesis of Aluminium- and Indium-doped ZnO Nanocrystals, J. Colloid Interface Sci. 2009, 334, 29. A. Puetz, T. Stubhan, M. Reinhard, O. Loesch, E. Hammarberg, S. Wolf, C. Feldmann, H. Kalt, A. Colsmann, U. Lemmer, Organic Solar Cells incorporating Buffer Layers from Indium-doped Zinc Oxide Nanoparticles, Solar Energy Mater. Solar Cells 2011, 95, 579.